Last week was graduation for our local HS, Great Bridge High School. My daughter Rachel, a junior, was selected to act as an honor marshall for the ceremony. Because our town doesn't have a large indoor stadium all the schools around here use the Ted Constant Convocation Center at Old Dominion University in Norfolk, VA.
We joke that Rachel's truck has about a 10 mile radius [it's older than she is and has 250,000+ miles on it] so I drove her and another girl to Norfolk that day for the ceremony. I had a couple hours to kill so I got a quick lunch at Chick Fil A and then scouted out a couple of thrift/vintage places I hadn't been to before. The large red tin and the small knitting needles came from Hope House Thrift shop. I actually already have this red tin, but if I have two then I can cut out pairs of certain designs that weren't possible with just the one. The knitting needles are sizes 0,1 & 2, the small sizes. These are great for polymer clay and the tiniest ones are good for polymer bead holes. At just $1 per pair they were a deal. The two smaller tins and the canning jar with sea glass came from Mrs. Pinkadot, a vintage store on Granby Street. Vendors rent small booths within the shop and trust me when I say there is A LOT to look at. I scored these two small tins. One in black with an asian floral motif and the second with 3 different painters featured and a beautiful lady as it's lid. The black floral tins lid is pretty cruddy even after a good scrubbing, but the sides have already been cut and are awaiting the next steps. 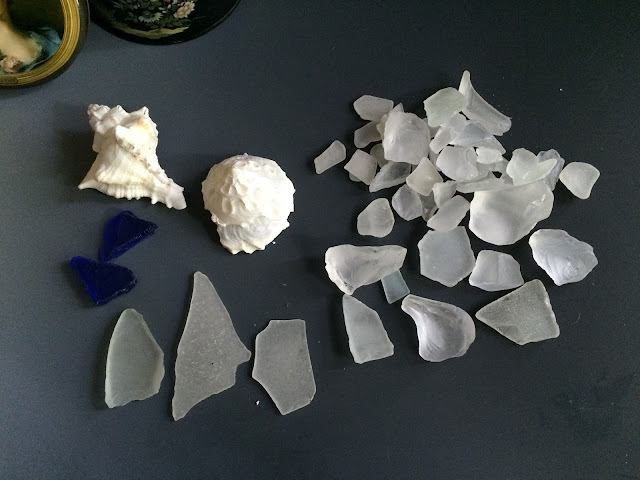 The contents of the canning jar with sea glass and shells is seen below. I'm sure it was meant to be a decorative item, but the shells are going in the big jar in my bathroom with other shells from my travels and the glass is going to be drilled for use in jewelry. So there you have it. Not a bad way to kill a couple of hours and satisfy my curiosity about places I drive by but never stopped at before. Have a great weekend out at your local yard sales and thrift shops.